Costa Azul Hotel is situated only 150 mt from the golden beach, between the Airports of Palermo and Trapani and near the most popular touristic and archaeological places. Balestrate is a small coastal town with two large beaches, located in the center of the Gulf area (Gulf of Castellammare), which can easily be reached from Palermo (distance 40 km) or Trapani (distance 60 km). 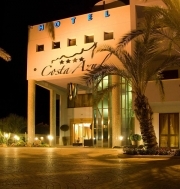 Hotel Costa Azul has 18 rooms in total: 6 suites, 2 mini suites and 10 standard rooms. All rooms have a balcony overlooking either the sea or the swimming pool. Composed of a living area with sofa-bed, a room with a double bed, a room with a single bed, a bathroom with shower and a balcony overlooking the sea or swimming pool and fitted with safe, mini-bar, 32” flat screen satellite TV, air-conditioning and heating, and WI-FI internet connection. Composed of two rooms with two double beds, a sofa-bed, a bathroom with shower and a balcony overlooking the swimming pool and fitted with safe, mini-bar, 32” flat screen satellite TV, air-conditioning and heating, and WI-FI internet connection. Composed of a room with two single beds or a double bed, a sofa-bed, a bathroom with shower and a balcony overlooking the sea or the swimming pool and fitted with safe, mini-bar, 32” flat screen satellite TV, air-conditioning and heating, and WI-FI internet connection. Our chef is a fantastic, brilliant, dynamic, tireless researcher, who mixes new ideas with the traditional Mediterranean and international cuisine. For him cooking has always been a passion. The conference room can accommodate up to 70 persons and is fitted with an 80” flat screen with a video projector and Hi-Fi Dolby surround. From the conference room you can see the Gulf of Castellammare. The conference room has been furnished and decorated with care and eye to detail, with an inviting and elegant ambiance as a result. Our guests can go to the bar area to relax, have a tea, a drink, a coffee, or an appetizer before going to restaurant Il Corallo where they can enjoy our Chef’s cuisine. The swimming pool area is fitted with all comforts: beach umbrellas, chairs and lawn chairs, a whirlpool, a bar and restrooms and is exclusively accessible to the guests of Hotel Costa Azul. Excursions to the archaeological sites of West-Sicily, the possibility to rent a beach umbrella or pedal boat, transfers from the hotel to the airport and vice versa, car and scooter rental. Parking lot, bar in the swimming pool area, laundry service with fee. Exit the highway at Balestrate. At the end of the exit turn left in the direction of Balestrate (sp17). Follow the road into town, keep right at the S-curve (Via V.E. Orlando). After 200 meters turn left (Via P. Gesugrande). Turn right at the Q8 (Via Madonna del Ponte) and follow the road in the direction of Trappeto. After 1,5 km turn left (indicated by a sign). You’ll find the hotel after 100 meters to your right.